Until now I was just the typical forum-lurker, but then I found myself to have too much time and created this little application. I got this Idea while scrolling through the forums and looking at all the signatures. While doing so, my phone catched my eye and I thought: "Wouldn't it be kind of fun to write an app like this?" So this is basically it, an Android application for your phone thats shows your stats. For now it will be only availabe here on the forums, so you have to "manually" install it with the .apk file. Auto update, you don't have to manually check! "Ah, but whats up with this annoying bug I found here?" If you happen to find any bugs or just want to drop some feedback, feel free to do so. You can either contact me directly, or leave a post in this thread. Please remember to post your phone and Android version and, if possible, a way to reproduce this bug. "You said something about.. multiple languages and.. contributing.. what gives?" There isn't that much text to be translated yet, but if you like, you could contribute with a translation. Simply drop me a message and I will send you the english texts to be translated. Almost every language is welcome so far. There is a translation interface now, contact me and we can talk about the access. "Can I help with the programming/coding?" At the moment I am not looking for a cooperation in that point, don't get me wrong, I appreciate the thought, really. But I don't think its necessary right now, maybe sometime in the future. "I got questions about how does THIS work or how did you do THAT?" Simply leave a post here or PM me directly and I'll see if I can answer your question. I don't mind, so don't be shy. "What IDE are you using?" I am using Eclipse right now, but I consider switching to Android Studio at some point. "Hey, what about releasing on the Play Store (Google Market)?" For now I won't release on the Play Store, I don't see the need for this, yet. I got my own update system, so this is no problem really. An upside would be, that I could reach more people with that. Feel free to drop your opinion anyways. There will be a release on the Play Store after 1.1.5, you will be noticed on your device. "Do you log any userdata of some kind?" I can see connections to the update server. With update 1.1.2 I started logging query traffic. All data that is collected is disconnected from the user! "Is osu!Rank compatible with Android x.x.x?" "What permissions are you using and why?" Query data from the osu!API or check the osu!Rank update server. Check for available network connection. Caching avatars and storing data. "I can't search for users with pure-numerical names!" This is a known problem within the osu!api itself. Simply use the user ID, this will work. After searching or setting the Widget with the user ID once, osu!Rank will remember it and connect the name with the ID. "What are those funny icons supposed to mean when using osu!tp?" See the documentation for more information about osu!tp itself. Let me just say "I don't plan to do it right now", but I actually was looking into it recently. Don't expect an iOS port soon, but there might be a version sometime! Pushed back due to other stuff. "Can I somehow test the newest Versions? (Pre-Releases)"
I actually got a test build where I update all changes that are not released yet, similar to the osu!test one. If you want to help, feel free to contact me. I am afraid osu!tp is down and will most likely be removed with the next update. [Fix] Performance updates for the API-Queries. [Fix] Changed server for updates. [Add] Added a contact Activity. [Fix] Moved some content from Copyright to Contact. [Fix] Panel-Widgets: Slightly changed the rounding of the corners. [Add] Mode icons instead of mode names everywhere possible. [Fix] Preperations for Play Store release. [Fix] Widgets: Optimized the code a little. [Add] QueryAPIConfig class for easier config handling of the queries. [Add] QueryAPIData class for easier data handling. [Fix] Implemented the QueryAPIData & QueryAPIConfig everywhere needed. [Fix] Improved caching a lot. [Fix] Fixed a naughty URL encoding bug. [Fix] Changed Backend behavior slightly. [Add] Implemented new caching system. [Rem] Removed the old caching system. [Fix] New target version: 19. [Rem] Reset to default output after Widget selection. [Add] AutoScroll function to Translator list. [Add] AutoScroll function to Event list. [Fix] Changed frame design of output. [Fix] Removed empty lines behind the events. [Fix] Panel-Widgets: Changed mode display. 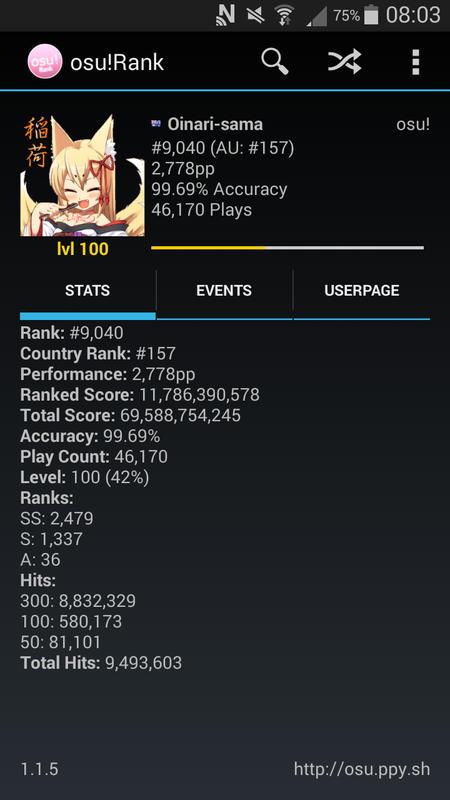 [Add] Country Rank to osu!tp. [Fix] osu!tp activity output is now in the same format as the Widgets output. 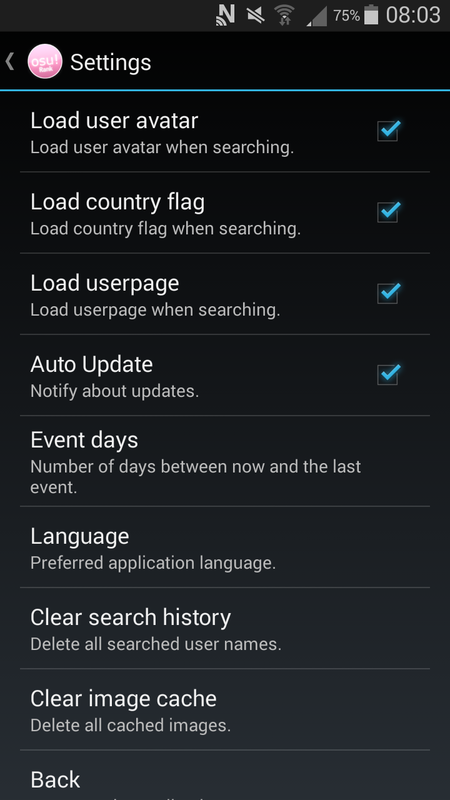 [Add] Option to disable country flags. [Add] Option to disable automatic event scrolling. [Fix] Changed "AutoUpdate" string to be more accurate. [Fix] Changed "Avatar cache" to "Image cache". [Fix] Changed internal folder structure slightly. [Add] Clean up app folder onCreate. [Fix] Possible solution for "No such user" when pressing random. [Fix] Adjusted debug output format slightly. [Fix] Interface adjustments for 2.2.3 Gingerbread [SDK 10] users. [Fix] Panel-Widgets: Rank overlapping left stats. [Rem] "Rank:" String infront of ranking, String now unused. [Fix] Placed the "Acc." & "Accuracy" String behind the accuracy instead of infront it. [Fix] Don't block last searched name after pressing "Random" and then trying to search for it again. [Fix] Numerical user names are now correctly searchable. [Rem] Ability to search by user ID, will (may)be back again later. [Fix] Exception when level value is null. [Fix] Adjusted a few debug features. [Add] Implemented osu!tp support for "Search". [Add] Implemented osu!tp support for Widgets! [Fix] Small adjustments to AutoUpdate backend. [Fix] Mail address inside "Contact" now clickable. [Fix] All around code cleanup, the usual. [Fix] Security based backend changes. [Add] On a whim I decided to add a Random-button! [Fix] Tried to fix issue where Notification crashes osu!Rank. [Fix] Changed debug cmd handling slightly. [Add] First steps for error reporting. [Fix] Changed difference calculation, first calculation after "Set Widget" should display correctly now. [Fix] Changed "Level percentage" to fit recent web changes. [Fix] Changed threading behavior of Widgets, should fix sudden lags and improve performance. [Fix] Changed Widget selection check slightly. [Add] A wild "Back" button appears inside the preferences, its very effective. [Fix] Like everytime, code cleanup. [Fix] Adjusted Primitive & Wrapper datatypes. [Fix] Reworked AutoUpdate completly, now working within the application! [Add] Contact section, also including all translators. [Add] All translators are now mentioned under "Contact". [Fix] Slight changes to Event parsing. [Add] Now also showing difference of Accuracy! [Fix] Changed behavior of "No such user" situation. [Fix] If Android Version > GINGERBREAD_MK1(SDK10) use different notifier. [Add] Clicking on Avatar inside "Contact" links directly to profile. [Add] "Invalid API key" notification, just in case. [Fix] Caught exceptions caused by negative integers. [Fix] Caught possible selection error. [Fix] 100% Accuracy not correctly displayed in some cases. [Fix] Changed parsing of JSON slightly. [Fix] Changed query behavior on same data. [Fix] Changed String insert function. [Add] Showing 5 most recent events when using "Search". [Fix] Changed handling of float values. [Fix] Changed Backend query slightly. [Fix] Changed "Set Widget" slightly. [Fix] "," is now allways used as the thousands separator. [Fix] "." is now allways used as decimal separator. [Fix] Changed Avatar cache bahavior to be more consistent. [Fix] Cached bitmaps are now again correctly deleted on Widget removal. [Fix] Changed handling of default output message. [Rem] ForceEnglish, farewell old friend. [Add] Language selection inside the Settings menu. [Fix] Clean up of dead code parts. [Add] Widgets automaticly update on "Widget set". [Rem] Got rid of the annoying SpamProtection, handling it otherwise now. [Fix] Optimized a few intents slightly. [Fix] Avatar-Widget: Adjusted Rank & RankChange margins. [Add] Panel-Widget: Now also showing changes for "plays", like Wide-Panel-Widget does. [Fix] Odd behavior of "Back-Button". [Fix] "Set Widget" only sets if there is different data. [Fix] "Search" only searches if its a different query than before. [Fix] Changed Avatar cache behavior on query errors. [Fix] Changed order inside menu. [Fix] Changed Bitmap loading slightly. [Fix] Added check for connection when clicking on the osu! link. [Fix] Query Logger now only logs existing users. [Fix] Removed whitespace infront of "Change me" string. [Fix] Sort "Search history" alphabetically and case insensitve. [Fix] Removed the max lines (5) for the output. [Fix] Adjusted max "Search History" length. [Fix] Changed the way of updating Widgets. [Fix] Changed ClickSpamProtection and SpamProtection slightly. [Add] Function to clear cache. [Fix] Catched a few more possible errors, while at it. [Fix] Panel-Widget: Adjusted the "Creation" and "No such user" message. [Add] New Panel like Widget: "osu!Rank (Panel)"! [Fix] Lots of code cleanup. [Rem] Icon-Widget: Got rid of obsolete "gamemode" tag. [Add] Icon-Widget: Showing the Accuracy now above "plays". [Fix] Complete remodel of Widget update function. [Fix] Icon-Widget: Changed size of "Status text". [Add] Panel-Widget: Avatar caching for offline views and performance. [Add] Panel-Widget: Also remove cached avatar if Widget is being removed. [Fix] Changed pp handling a little. [Fix] Widget selection now displays changes correctly. [Fix] Reworked query function for more performance. [Add] Included a (now working) timeout for the Widget and the Application. [Fix] Changed behavior for "user does not exist" cases. [Fix] As always, random code cleanup. [Fix] Cleanup in Backend script. [Fix] Internal string changes in Backend script. [Fix] Improved update performance, also included timeout. [Fix] Rewrote the whole error handling. [Fix] Status message and Text got a slight glow now. [Fix] Fully reworked the Widget update function. [Rem] Replaced debugger/placeholder string "Nonce" with... empty space. [Fix] "Force english" should now work correctly on Widgets. [Add] New strings for the update prompt. [Fix] Remodel of a few classes for performance. [Fix] Changed typo inside DE string. [Fix] Loading "Force english" config earlier now. [Fix] Removed loading "Force english" on resume, should still be present. [Fix] Forcing a restart on "Force english" to reload all Strings correctly and cleanly. [Fix] "Force english" is not that aggressive anymore. [Fix] Random code cleanup, again. [Fix] Adjusted a layout variable for the Widget. [Fix] Changed "No Widget" string (EN, DE). [Fix] Changed minSdkVersion to 10 (still working on lower support, target is 17). [Fix] Changed SpamProtection for the Activity slightly. [Add] Included a "Change me!" string for empty Widgets inside the Activity (EN, DE). [Rem] Removed all traces of the old icon, goodbye old friend. [Fix] Caught possibility for errors inside the accuracy. [Fix] Changed the check behavior inside the menu a little. [Fix] All around code cleanup. [Fix] Changed positioning and handling of avatars slightly. [Fix] String changes inside DE. 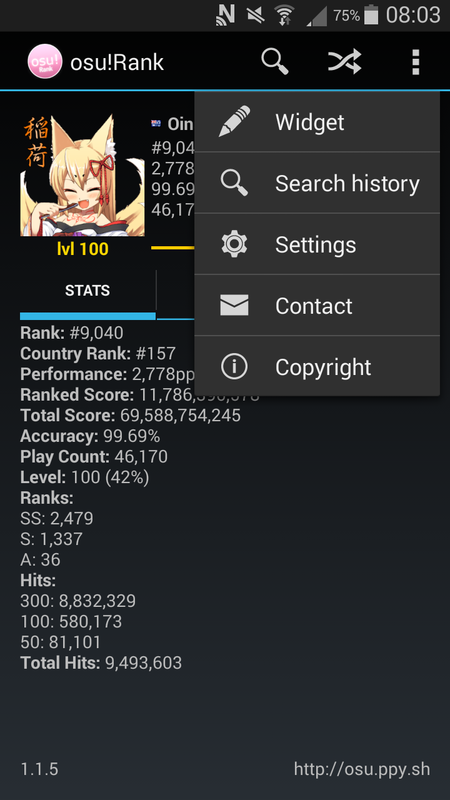 [Fix] Changed .apk name to include the version: "osu!Rank-1.0.2.apk"
[Fix] Pressing back in MainActivity now closes the Application again. [Fix] Database error when using osu!tp. [Fix] App crash caused by loading not existing user avatars. [Fix] Rework Search History saving. [Fix] Rework Widget config saving. Last edited by givenameplz February 5, 2016 at 11:45:27 AM GMT , edited 208 times in total. EDIT2: I forgot to translate the Flush Out string. Now its done. I also translate better the query strings. Last edited by Kyujuroku 96 May 28, 2013 at 8:41:08 AM GMT , edited 3 times in total. The app currently doesn't accept username with special characters, eg [ ]. This needs to be addressed as there are usernames with those characters. The osu!rank settings interface is not so intuitive at the moment. It took a while to figure out that one must select which "Widget" position first from the middle of the screen, then Query the username, finally "Set Widget" to get multi widget to work. - Move the "Widget" selection to the top. Rename it to something like "Widget#" or something like that. - Put a title next to the username input space, eg "Lookup Username:"
Thanks, I will send you the english texts with a few notes, check your PM. If you have any questions feel free to ask. This was what I was looking for. Amazing Feedback. I was really looking for an idea for a new layout, as I didn't liked the actual one. Your ideas are really great and I will consider them in the next update. They will most likely come with the AutoUpdater update, within the next days, maybe. As for the username: Whops, I thought I forgot something. Thanks for the heads up, will also be fixed.